ClassNK is well regarded as a highly reliable, trustworthy and impartial third party organization by marine transport, shipbuilding, and other maritime related industries around the world. Importantly, classification and registration of a ship by the Society ensures the ship is recognized by underwriters the world over, including the Institute of London Underwriters. Before a ship or offshore structure can be registered, it must be surveyed in accordance with technical Rules and regulations of the Society. Once the ship has been surveyed to the satisfaction of the surveyor, classification of the ship is reviewed by the Classification Committee of the Society. If approved, a certificate of classification or installation registration, as appropriate, is issued and the ship is entered into ClassNK's Register of Ships. Ships and offshore structures together with installations that have been classed and registered with the Society undergo periodic and occasional surveys to ensure that they continue to satisfy ClassNK technical Rules and the requirements of class. 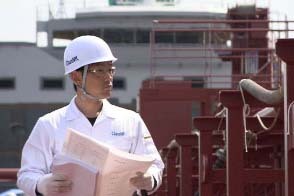 ClassNK performs drawing examinations,approvals, and ship surveys as part of its services for registering and maintaining ships in class. In order that these activities may be carried out more effectively, the Society also conducts various other approval and inspection services as described below. Equipment and devices used in life saving appliances, fire extinguishing systems and other types of arrangements. 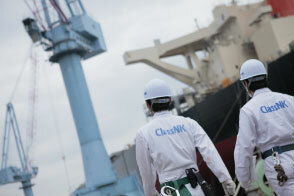 In order to rationalize the conduct of classification surveys as well as assure and enhance the quality of ships under class, ClassNK conducts assessments of the quality systems, production processes, and facilities of manufacturers based on various technical Rules for the purpose of approving the production, maintenance and repair of materials, equipment and other components used onboard ships classed with the Society. Manufacturers whose quality systems and actual production practices have been thus approved may have certain aspects of surveys of these materials and equipment simplified. The Society also carries out inspections and approvals of companies who provide testing and measurement services that are used in the survey and registration of ships and machinery as well as the maintenance of class. These include inspecting the quality system of the companies, the education, training and qualification of technical staff and other personnel engaged in providing the service, as well as inspecting the testing and measurement instruments and equipment used in the course of providing the service. Companies found to satisfactorily meet the requirements for providing a given service are approved as recognized service providers with respect to the conduct of related surveys of ships and equipment.